The new dissection room of the Department of Anatomy had a ceremonial opening on 3 December. The entrance to the Medical School campus from Honvéd street has become dangerous due to the construction work in progress. We wish to divert the pedestrian and cyclist traffic to the sidewalk in front of the University Pharmacy. Within two weeks time the fence in Honvéd utca will be opened, the pedestrian and cyclist traffic will be diverted through this new entrance. On Saturday, October 20th, the second demonstrator workshop - internal medicine: introduction to internal medicine - took place at the MediSkillsLab. The White Coat Ceremony organized by the English-German Student Council took place on September 17. Students having started their pre-clinical studies received the symbol of medical profession, the white coat from the directors of the institutes and clinics teaching 3rd-year subjects. On June 29, the day before the Graduation Ceremony for Medical Doctors we organized a campus tour for families and friends of our graduating students having visited the MediSkillsLab, Insitute of Physiology and Institute of Anatomy. On 21st March 2018 was the Grand Opening of PTE 3D Laboratory with ultramodern 3D printers and several special diagnostic and research equipment, which is going to have a significant part in education and research. As an extension of the World Mental Health Day upon the invitation of the EGSC Aoife Khan, our 4th-year student of General Medicine shared her story living with an Eating Disorder. It has been stated by the British psychiatrist Dee Dawson that “one-third of sufferers fully recover, one-third live symptomless life with continued distorted thoughts, and finally, one-third never recover”. Aoife was categorized as the one-third which will never recover from the illness, however she has learned the recovery was possible. During this semesters’ course closing field training of the Medical Aspects of CBRN Warfare optional course our students were able to test in practice the most important acute care inventions already introduced to them during the academic lectures. In accordance with the objective of the course the lecturers emphasized the most important knowledge of CBRN (chemical, biological, radiological and nuclear hazards) protection. The event took place on November 4 at the Baranya County Disaster Management Directorate's special field on Árpádtető. In October, 2017 NMSA held a 3-days intubation course in the MediSkillsLab for norvegian medical students of the University of Pécs. NMSA is the Norwegian Medical Students' Association, which is the student body of the Norwegian Medical Association (NMA). It was created in 2009 when the former medical student body of the NMA merged with the former IFMSA-Norway. NMSA is therefore an organization with roots in both NMA and the International Federation of Medical Students' Associations (IFMSA). They work with national issues on how to improve the residential clinical training of graduated medical students and various aspects of their medical education. Hyeonsung Yang and his college are graduted medical doctors from the University of Pécs. They came from Korea to prepare to their licence exam and practice in the MediSkillsLab. We wish good luck and all the best. On September 21st EGSC donated a defibrillator to the City Library and Regional Centre for Learning. This donation happened in context of the International Evening 2017 and proved neccessary, because two students collapsed on the premises of the library in the last exam period. Thanks to the fast first aid of fellow medical students, both students, partly in critical condition, could be stabilized. This donation will give first aid helpers the right tool to react properly in future situations like this. The board of EGSC would like to thank Márton Sziráki, 6-year medical student who is going to teach the staff of the library how to use the defibrillator. More than a thousand people visited the FENS Regional Meeting organized jointly by the Hungarian Neuroscience Society and the University of Pécs, among whom were the Nobel Prize winner Thomas Südhof and the latest Brain Prize winner researcher, Wolfram Schultz as well. In the course of the ceremony held on 18 September, the Hungarian, English, and German Program students who have begun their preclinical studies were given the symbol of the medical profession, the white coat, by the directors of the clinics and the institutions teaching third year subjects. The English-German Student Council donated body warmer equipment to the Paediatric Clinic on May 24. The equipment not only helps to maintain proper body temperature during prolonged surgeries, but also lowers the risk of decrease in body temperature allowing for a fast, constant and safe regulation of body temperature. During the open day designed for a group of premed students of the University of Pécs International Studies Center, the visitors listened to a presentation about the English Program of the Medical School, took part at a seminar in the Department of Anatomy, and visited the Medi Skills Lab. During the open day designed for the students of the joint 1+5 program of the Björknes College in Oslo, Norway and the University of Pécs Medical School, the visiting students listened to a presentation about the English Program of the Medical School, had useful info meetings with the student representatives of Norwegian student associations in Pécs, and took part at a seminar in the Department of Anatomy. They also took a CSI tour in the Department of Forensic Medicine and visited the Medi Skills Lab. Staff members of the Ministry of Education and Ministry of Foreign Affairs from Iran, the rector of the Yazd University and staff members of the Iranian Consulate from Budapest visited our School on January 27. Discussions were lead on topics related to the recruitment of Iranian students applying to our Medicine and Pharmacy Programmes as well as other general cooperation issues, e.g. dual training and exchange programmes. Members of the delegation were received by Dr. József Bódis, the rector of the University of Pécs and the leadership of the Medical School and the Faculty of Pharmacy. The guests had the opportunity to meet Iranian students studying at Pécs. This year was the 8th Advent Concert at our faculty on the 7th of December in the Aula at 8 o’clock. The free concerts were initiated in 2009 by students, and supported by the Dean's Office, HÖK and EGSC. Thanks to the rehearsals, and gatherings from more and more students and professors turned out that they excel outside of medicine in music, literature and dance. The concert has not lost its popularity although the performers change from year to year. Luckily as the number of the foreign students increase, so grows their number participating at the concerts. During the open day designed for the Japanese premed students of McDaniel College in Budapest, the visitors listened to a presentation about the English Program of the Medical School, took part at a seminar in the Department of Anatomy, and visited the Medi Skills Lab. The UP Faculty of Pharmacy has invited students and fellow colleges to gather and light a candle in memory of András Dékány former pharmacy student who died tragically in 2009. 20th Jubilee Congress of the Hungarian Association of Hungarian Oral and Maxillofacial Surgeons, Siófok, 29/09-01/10. 2016. Our Colleagues represented the Clinic of Dentistry, Oral and Maxillofacial Surgery with the following lectures: Surgical removal of giant submandibular sialoliths (Bálint Tordai, Nóra Stáczer, Róbert Horváth, László Vajta, József Szalma); Dental and oral surgical treatment of medication-induced bleeding patients: Audit of the national guideline in Hungary (Dénes Lukács, Nóra Stáczer, László Vajta, Árpád Joób-Fancsaly, József Szalma); Intracanal temperature changes during bone preparations close to and penetrating the inferior alveolar canal: Tungsten carbide drills vs. diamond drills vs. piezosurgery (József Szalma, László Vajta, Edina Lempel, Lajos Olasz, Norbert Jakse). Professor Olasz was invited as a speaker in the section investigating the ’Future of Oral and Maxillofacial Surgery’, while József Szalma was invited as the chairman of the Implantology section. Opportunities offered by the Demonstrators Society were presented by Dr Andrea Tamas, chair of the Society and and Dr Laszlo Czopf, associate professor, course director for demonstrators’ courses at the congregation held for the second time this fall.The experiences gathered in the process of work were summarized in a presentation by undergraduate student Jason Sparks and PhD student Dr Laszlo Kovacs. Currently arising questions and new ideas were also discussed at the meeting. This year we hosted the 5th Student Research Workshop at the University of Pécs Medical School, where clinical representatives and heads of departments came to show you the different projects they are working on, and possibilities of joining. The primary goal is to present the work of departments and motivate students to take part in Student Research as soon as possible. Yossi Amrani Ambassador of Budapest from Israel State first visited Pécs. The Pharmaceutical Care Skills Competition at the University of Pecs Faculty of Pharmacy is an interactive element of pharmacy education in the fields of pharmaceutical care and communication. It provides students the opportunity to improve their skills in everyday practice and improve patient care. A formal signing of the agreement with the recruiting company USA EDU KOREA also took place in the frameworks of an open day designed for interested students and parents from Korea. During the open day, the visitors listened to a presentation about the English Program of the Medical School, participated at some practices, and visited the Medi Skills Lab as well as the Janus Pannonius University Hospital Block. A field practice had been jointly organized by the Dept. of Operational Medicine UPMS and the MediSkillsLab on last Sunday. The practice was part of the Medical Aspects of CBRN (Chemical, Biological, Radiological and Nuclear) Warfare optional course and the participants could test their skills in CBRN detection and protection as well as in the transportation of the wounded. 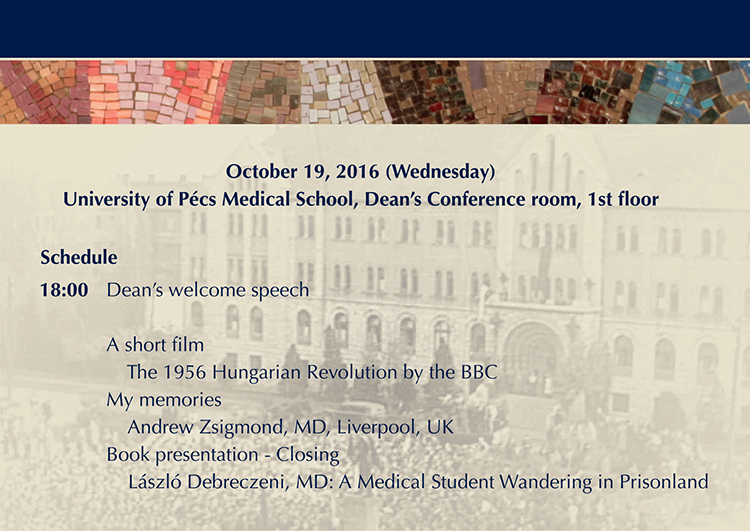 On the 28th of October 2016, students and staff members commemorated those who after their death, served the education of the medical students. The commemoration started with a ceremony in the chapel of the cemetery with the student's memorial program. MD Richard Hardi volunteer ophthalmologist, monk healing the patient's of Congo. About eight millions of people in the County healed by just two of them. The University of Pécs Medical School, Medical Students Sports Association and the Mecsek PVSK Füszért water polo team proudly introduced the first water polo charity gala with the patronage of Kemény Denes and Attila Miseta and with the participation of Olympic Champion water polo players (Zoltán Kósz, Tamás Molnár, Attila Vári, Péter Molnár). To further enhance the quality of education at the Medical School EGSC has ordered state of the art, handmade SOMSO anatomical models from Germany per suggestion of the Institute of Anatomy which were recently handed over to the institute. EGSC hopes that students will reap the benefits in the years to come. During the course of our first White Coat Ceremony Hungarian, English and German Programme students having commenced their pre-clinical studies will receive a white coat from the heads of clinics and institutes teaching them. Among the main topics of the meeting were the development of the knowledge management portal www.operationalmedicine.eu and possible use of the Voluntary Military Service System in military health care. Beside the representatives of the Hungarian Defence Forces and the Department, Katalin Németh MD, László Grama MD PhD and István Almási head of department at the János Balassa Hospital have attended the event. A ceremonial signing of the Letter Of Intent between the Hungarian Prison Service represented by Lieutenant General András Csóti Director General and the University of Pécs represented by Attila Miseta Dean of the UPMS took place in 7th September. The main goal of the agreement is the Medical School’s participation in the penitentiary training system of the HPS and to cooperate through common projects, conferences and networking. The month of August UP MS students had the opportunity to try out the latest simulation tools in professional training on August 9 and 10th at UP MS Simulation Training Centre. The Tactical Trauma Life Support (TTLS) Course has been organized for the second time between 22th and 24th of July. The event has been realized within the framework of the cooperation between the Department of Operational Medicine, the Dept. of Anaestehisology and Intensive Care, the PPA-International Medical and the Defex Hungary Ltd. During the intensive course the participants have learned the basics of the trauma care on the battlefield, which can also be well-used in civil life. With the contribution of hyper realistic simulations real-life imitating stress situations were established, which had put the participants to the test throughout the training. As part of the presentation the attendants received answers to all their questions, and were also able to try out the device. The birth simulator was presented by Medi Skill Lab Training Centre of the University of Pécs. The Hungarian Anatomist, Pharmacological, Physiological and Microcirculation companies Scientific Conference – June 1-4. 2016. Representing the English-German Student Council, Amir Reza Ashraf English president and Lucas Wildenhayh German president handed over their donations on May 25, 2016. Two analytical and five tara scales were donated to the students and professors of the Faculty of Pharmacy, 16 phonendoscopes and 16 reflex hammers to the Institute of Physioplogy and to the Ophthalmology Clinic an automatic projector to measure visual acquity. Students of the Dentistry major have also benefited from the donation: their work and education are supported by a newly bought articulator. This situational competition combined shooting and tactical action exercises. As well as last year, the medical attendance embedded in police tactical action was a special task. The team had to provide life-saving medical assistance to the injured person who was bleeding and under the influence of drugs while ensuring the safety and efficiency of the police measures. The professional conditions have been set up by Police Medic B-team and PPA International Medical. Between the 6th and 8th of May, 2016 the Department of Operational Medicine of UP MS and Danish partner PPA International Medical, police captain dr. Márk Vajda - staff for injured patients has joined to a three-day course "Prolonged Fieldcare Course". The photos are from employees of PPA International Medical. Information day for graduating students. Posters will be exhibited, made for "Frontiers of Anatomy" credit point course, on the Hall. The material were compiled by Viktoria Vicena student, MD Balazs Daniel Fulop assistant lecturer and MD Dora Reglodi course leader. Between 12 and 14 April 2016 the delegation of the University of Pécs Medical School, led by Prof. József Bódis, the rector of the University, visited Heidelberg and Kaiserslautern, Germany. In addition to professional events and lectures in Kaiserslautern, during the two-day program the delegation met the representatives of Medical Faculties of Heidelberg, Mannheim and Mainz and made a visit to Nobel prize laureate Prof. Harald zur Hausen at the German Cancer Research Centre. Dr. Bennet Omalu was the first to discover some associations between the premature death of American Football players and chronic damages to their brain. He published his results in opposition to the National Football League, one of the most powerful and richest organizations of the world. In his motivational speech he advised our students to stand up for their truth, not to be discouraged by anyone and to believe their faith. Police officers participating in the "Police Medic" Program proved their acquired knowledge within the framework of an impressive display which took place at an annual event organized by the UP MS Student Council. The major goal of the program „Police Medic” is preparing the police staff to recognize and abolish any life-threatening danger in situations require law enforcement dispatch. The structure of the program consists a theoretical and a practical training module followed by realistic situational exercises performed under both physical and mental stress. The "Police Medic" Program is based on the agreement between the University of Pécs and the Hungarian Police Forces and involves the Department of Behavioural Sciences, the Department of Anathomy, Department of Anaesthesiology and Intensive Therapy and the Department of Operational Medicine. Signing an agreement between UP MS and Premed Pharma Ltd. The Rector of the University of Pécs, professor József Bódis awarded doctor Honoris Causa title to the former Prime Minister of Romania, Mr. Mihai Razvan Ungureanu and former Ambassador of Finland, His Excellency Jari Pekka Olavi Vilén on 13 December 2012. Congratulations to Professor Béla Mess on his 85th birthday and congratulations to Professor Zsuzsa Füzesi on her promotion to full professor. A new eco-playgroud -built from donations- opened in the garden of the Paediatrics Clinic. The handover ceremony took place on October 28, at 11.00. Not only the children hospitalized at the Department of Oncology will be quick to take possession of the new playground but also those children who come for regular check-ups having received the active treatment. Due to the overwhelming success of the International Evening 2010 the English-German Student Council donated 1.6 million forint to the Paediatrics Clinic. The official handover followed by a short press conference took place in the Conference room of the faculty. Faculty of the University of Pécs. extracting teeth on dummies and making pills). Birthday Celebration: Prof. Dr. Bauer Miklós "80"
leadership of the faculty were invited for the first meeting.